So if you risk $1 for every $5 that you intend to make, then you only need to be right 21% of the time to be a profitable trader. Don't get me wrong, trading is not this simple. You can't just buy at any given moment with a 1/5 risk/reward and be a profitable trader. However, many of the mistakes that are made during the trading process are a result of questioning yourself, and defining risk/reward allows you to eliminate this lacking confidence. That brings us to our next aspect of growing a portfolio, maintaining confidence. Whether you like to admit it or not, your confidence has been lacking at one point in your trading career. Don't worry, that's perfectly normal! But there's a difference between being in denial that you have a working strategy and losing confidence because you made an emotionally-driven mistake. You can tell if you have a working strategy by back testing it and seeing its consistency and overall return. To give you an example of maintaining confidence, I want to bring up one of my favorite new members. He has an analytical mindset and pulls in close to $11k per week with his scalping methods. Due to some irregular market movement, he lost $4k in one week. Keep in mind that he has been trading with real money for two months (paper traded for four months before that) and has a 72% win rate. He took a week off after his $4k loss (despite his huge winning streak beforehand) and missed out on some of the best price action I've seen in years (blockchain run up). The takeaway here is that with a proven strategy, one loss or losing week should not result in a significant lack of confidence or even taking time off. By doing so, this member created an emotional barrier by himself and missed out on plenty of opportunity. Portfolio A has 3 more small losses than that of Portfolio B. Portfolio B has 1 more small win and 2 large losses. Notice that even though Portfolio A's win rate equates to 53.8%, it still had 32% more in profits than that of Portfolio B. That measly $152 doesn't look like much, but 32% is a figure that will wake you up and slap you into shape! In the long run, that 32% can get out of hand and really hurt your total profits. So how do you avoid large losses? Cut the loser loose when it hits your risk, you can always reenter again later. Do not fear missing out on a trade, there will always be more setups. The market isn't going anywhere! And last but not least, DO NOT lie to yourself. Price conquers all and if the price starts moving in the opposite direction of your trade, chances are you're wrong and you need to cut your loss. I always like to define concrete steps that our blog followers can take in order to gain something tangible from these educational posts. 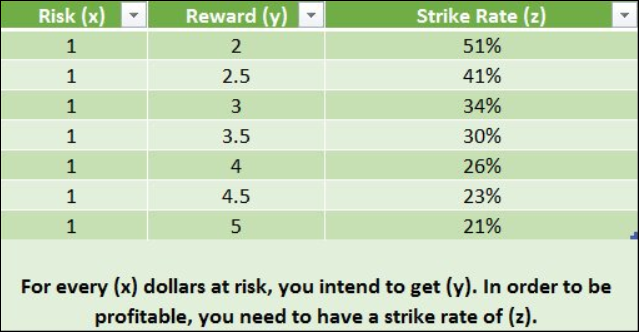 Moving forward, define your risk/reward not only for each trade but also for your portfolio. If you break your risk/reward rule that you have defined, then you are fully responsible for your loss. Do not lose confidence from a single loss or a bad week. All traders take losses and if they say they don't they're lying. And last but not least, try to avoid large losses altogether and your portfolio value should consistently increase. Share it with your friends. !